Vuclip, a leading technology-driven media company, announces the launch of SWITCH, the first Indonesian original production for its OTT video service Viu. Viu’s foray into originals in Indonesia highlights its commitment to the Indonesian market and is inline with its global strategy to create high quality, locally relevant content. SWITCH is a romantic comedy drama series and the story revolves around two best friends whose lives turn upside down when one fateful night their souls switch. The cast includes leading Indonesian film stars: Morgan Oey, Karina Salim, Tatyana Akman, Vincent Tio, and Asmara Abigail. The show was directed by Nia Dinata and Pritagita Arianegara, and the script was produced by the five winners of the first Indonesian female story writing competition held in March earlier this year, as part of the Viu Female Story Festival 2017. The "Dari Mata" song from Jaz was chosen as the original soundtrack. 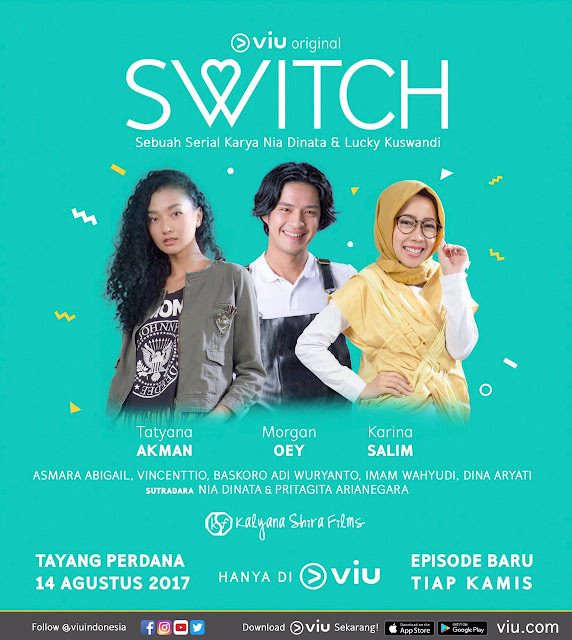 The series will have 13 episodes and will be exclusively available on Viu in Indonesia, Malaysia and other countries starting 15 th August 2017, with a new episode released weekly. It can be accessed at https://www.viu.com or by downloading the Viu Android app from Google Play or the Viu iOS app from the Apple App Store.